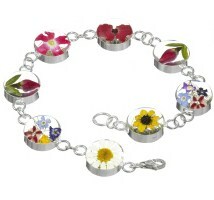 Sterling silver bracelet, set with real flowers encased in resin. Size approx 19.5cm long, with each round flower set link being approx 1.2cm. Supplied in a "Made with real flowers" printed gift box.